Description of "The Bombay Review"
The Bombay Review is a bi-monthly literary magazine publishing short fiction and poetry. Based out of New York and Mumbai, the magazine also conducts literary events across cities. The best of the online pieces are published in this first of its yearly anthologies. Founded in August, 2014, the magazine's readership spans across more than 90 countries and it publishes writers from all over the world. 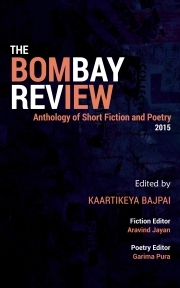 For submission guidelines visit: thebombayreview.com. TBR is the fastest growing literary magazine in India, in terms of reach and popularity. It is run by a team of passionate 20 year olds, and has been featured in Times of India, Hindustan Times, Sakaal Times, Pune Mirror, Golden Sparrow, and other vernacular dailies. With teams in more than twenty cities, they are now expanding to US, UK, Nigeria, Bangladesh, Pakistan, and UAE in the coming year. Kaartikeya Bajpai, 20, a journalism graduate from Symbiosis International University, India, is the Editor-in-Chief of The Bombay Review. His fiction was first published in Chandamama when he was nine and his work has since appeared in Tehelka, Helter Skelter, Muse India, Spark Magazine, Reading Hour, Sahitya Academy’s Indian Literature Journal, Roots and Meanderings Anthology, Significant Anthology, Everyman’s Science among others. He has worked as a crime reporter for Mumbai Mirror, cultural reporter for Helter Skelter, features writer for DNA and is currently doing his masters in Creative Writing, from The New School, New York. He gave a TEDx talk at IIIT Allahabad, India, in January 2016, and shared The Bombay Review's story. Reviews of "The Bombay Review"